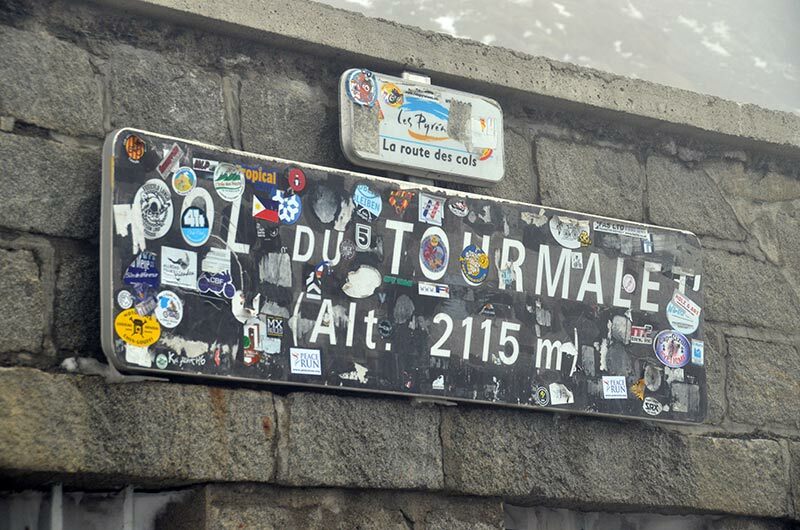 The Col du Tourmalet can be climbed in both directions, and offers a similar gradient and challenge. 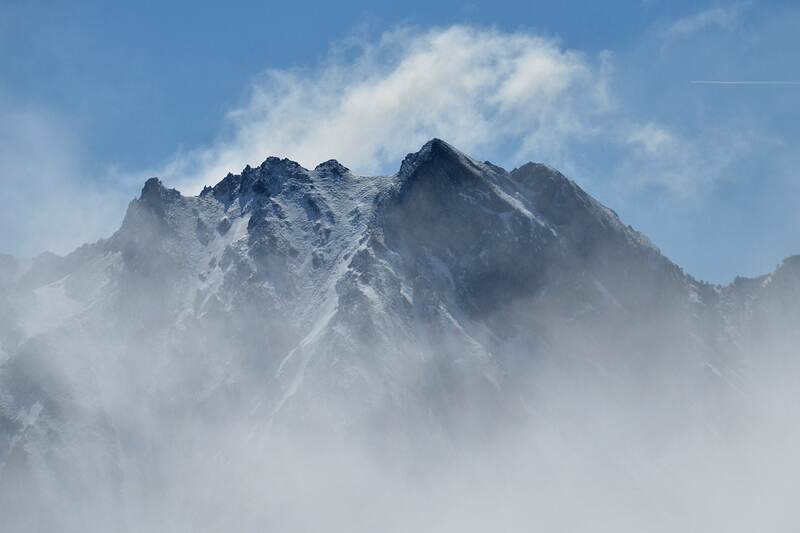 The altitude at the summit is 2,100m and the weather can be very variable. 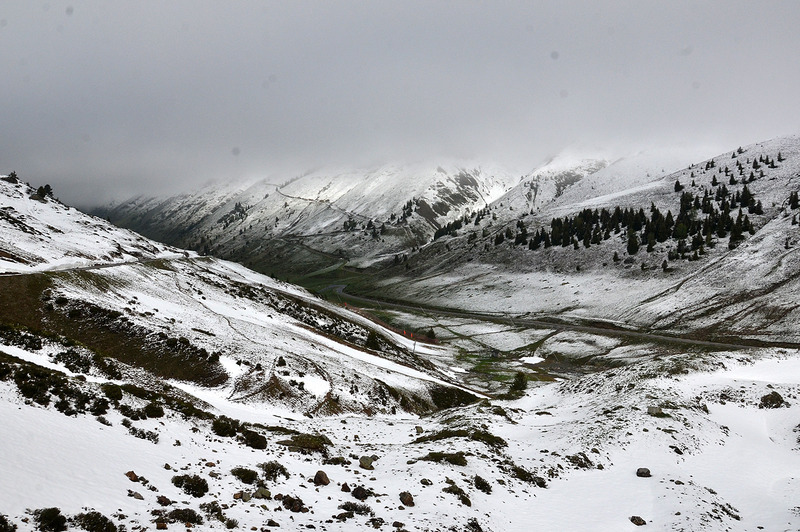 The first time I climbed Col du Tourmalet, the temperature got down to 3 degrees and within 15 minutes the sky changed colour several times. It’s hard to believe, but many photos on here are all within a few minutes of each other. 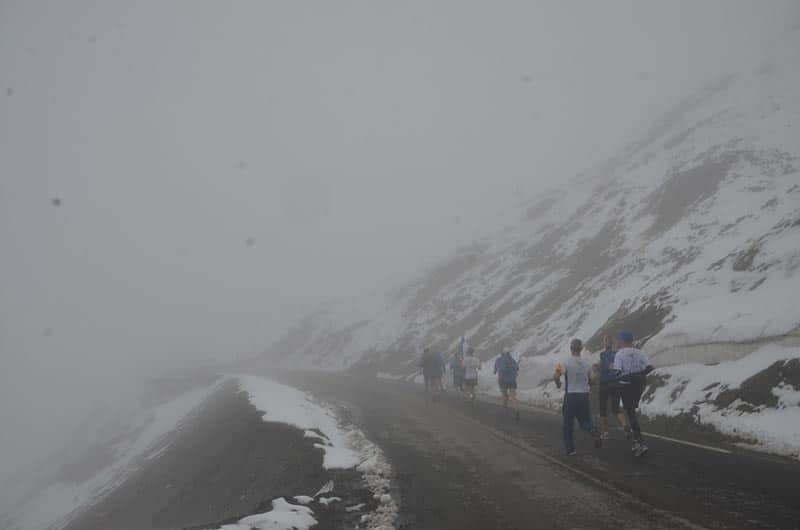 Climbing through the clouds – five minutes later. 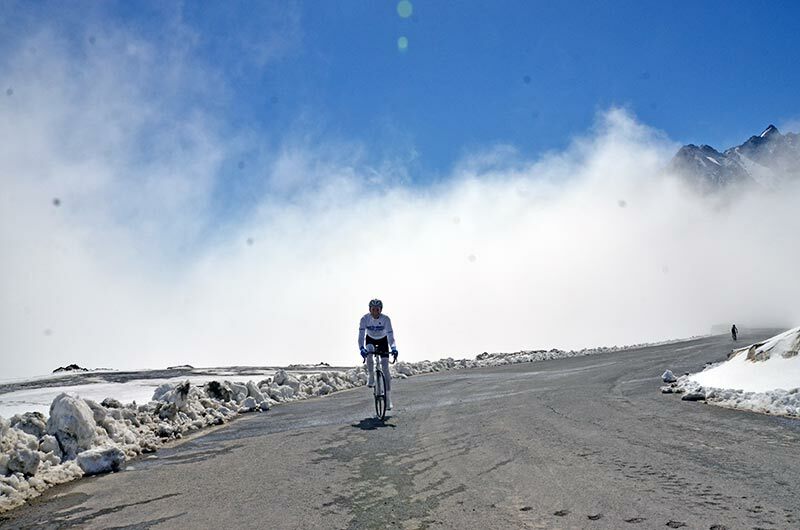 The over-riding emotions of the climb is that it is ‘unending’, ‘unrelenting’ There is no real chance for recovery like you might get in a usual ride. It feels like you’re riding fixed and if you stop your cadence, you can ground to a slow speed very soon. 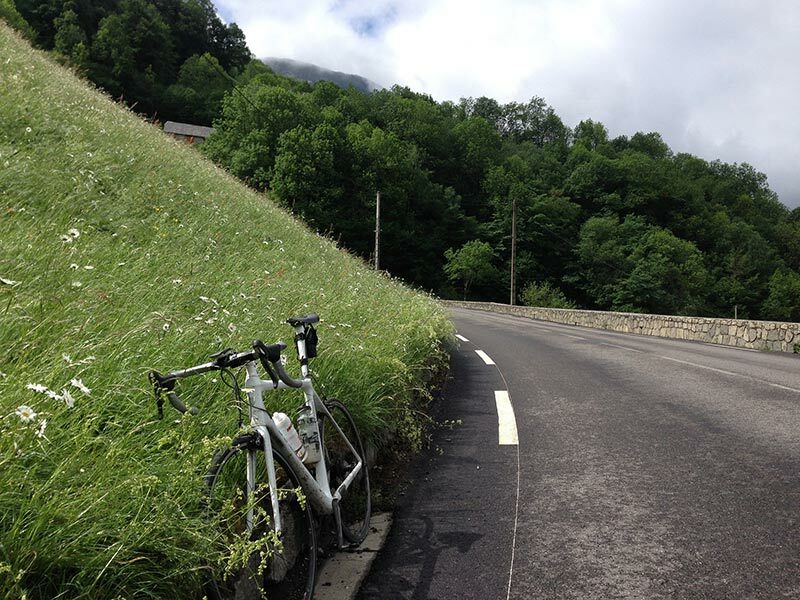 When riding these climbs, you’re always conscious that your treading a fine line. 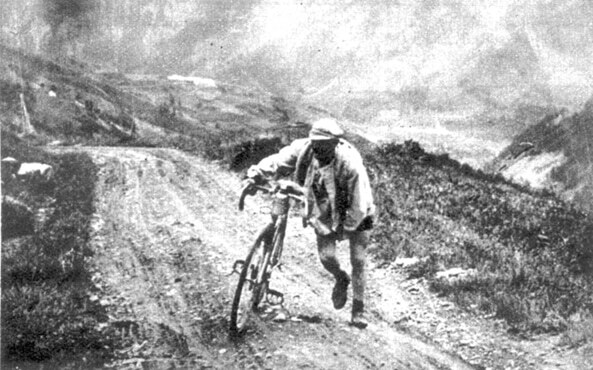 Go a little too hard, and you cross a threshold of tolerance – which will make the last kms really tough. If you ease back for a km, you feel a little more energy and you become tempted to lift the pace again. The smallest variations in speed can have a big impact on the state of your legs. 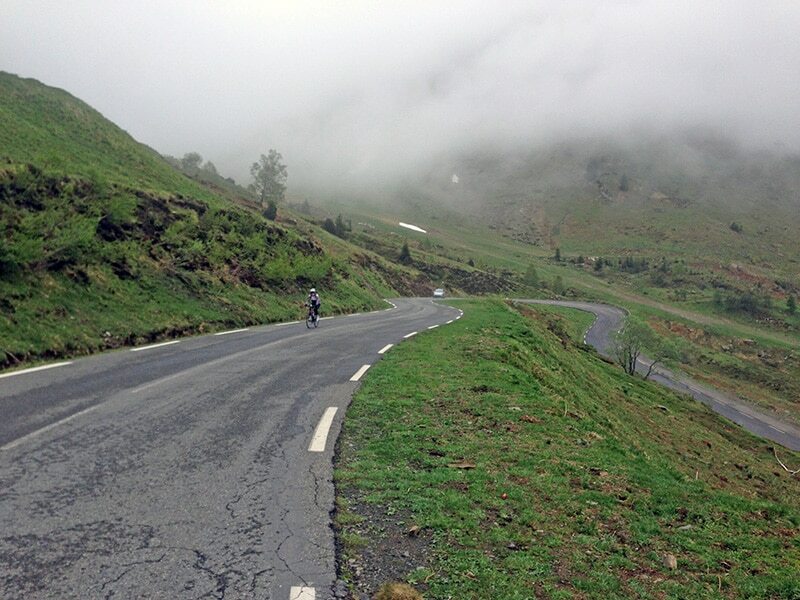 Riding the Tourmalet, I understood better why pacing is so critical in mountain stages. There is a real exhilaration in this continuous climbing. When the climb is going well, there is a great sense of rhythm; you’re just going up hill and the altitude meter is getting higher and higher. At other times, you may feel exhausted and then you look up and see the towering mountain roads above you that still need to be climbed – this can be a tough one for the mind. The first day I rode I was aware it would be very cold at the top, so wore several thermal layers, this became quite hot and sweaty on the way up, which made it a little uncomfortable. Because it was my first climb, I took it at a very good rhythm, but with always just a little bit in the tank, which was a good feeling. One reason I came to Pyranees, is that some friends were doing the Sri Chinmoy Oneness-Home Peace Run from Portugal to France. 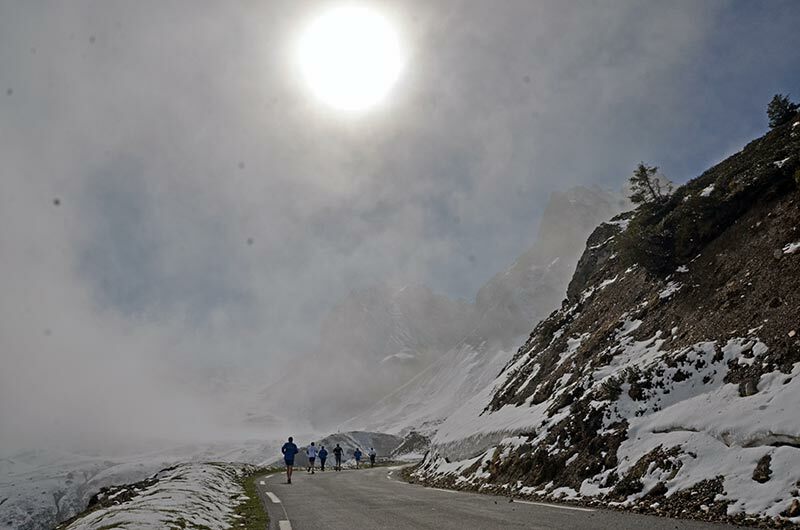 On Saturday they were running up the last half of Col du Tourmalet, I fortuitously caught them 2 kms from the summit, so I got in a few photos. 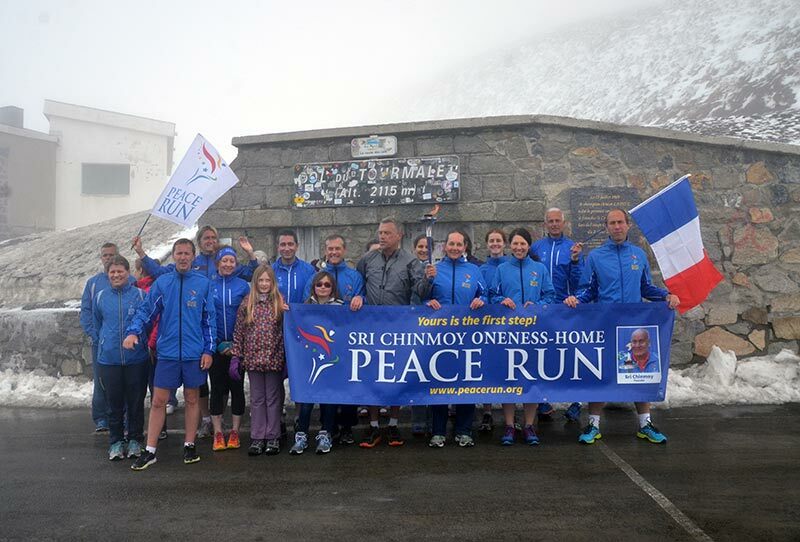 (Most photos on this page are from Peace Run photographers. Many Thanks.) 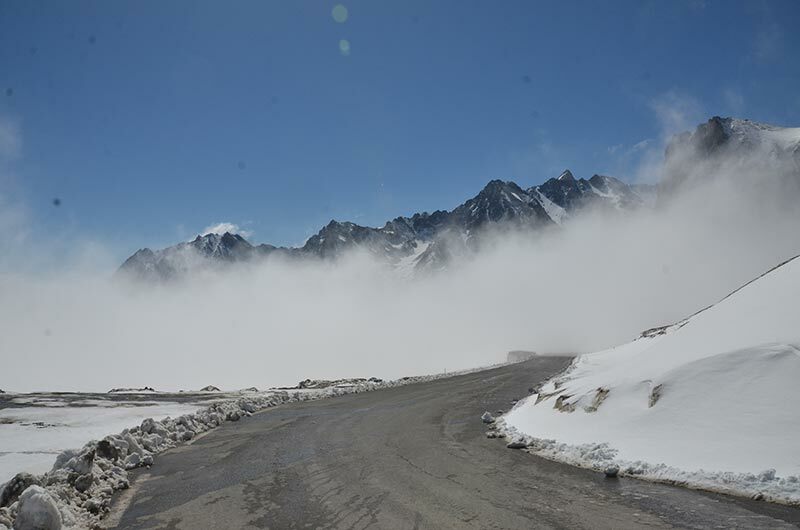 When we set off, the Tourmalet was said to be closed, so we didn’t expect to get to the top but, as we were climbing, the snow gendarmes opened the road. 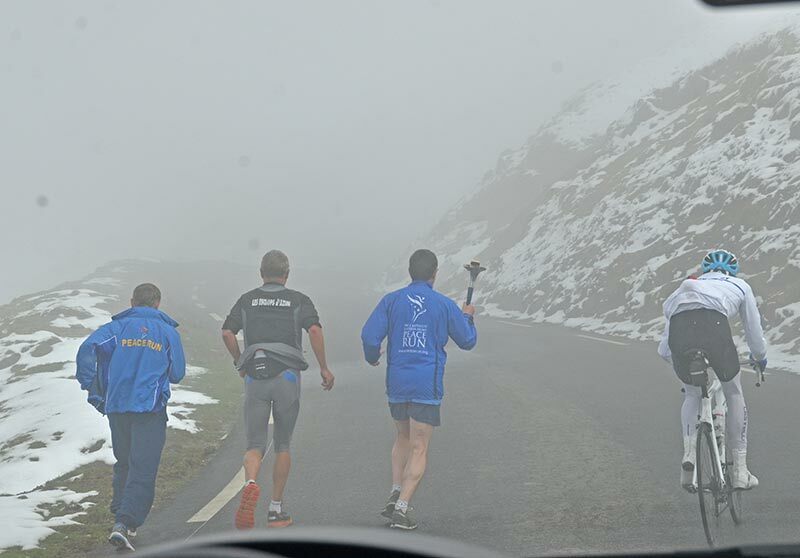 I must admit, in those conditions, it was great to be climbing the mountain with others. 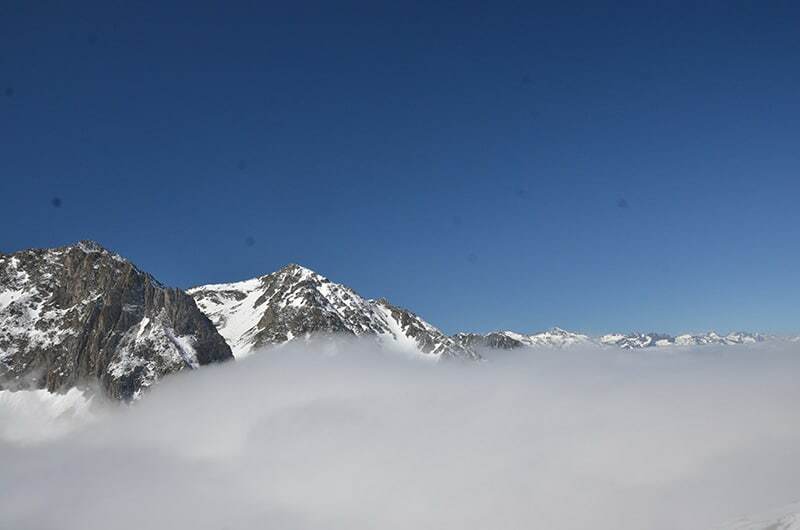 The weather up there can be so variable and challenging. There was a moment when the sun burst through the heavy fog and clouds – it was one of those magic moments, which you can get in this part of the world. I think I did that ascent in about 1 hour five minutes. I managed to loose my gps file, but to be honest I didn’t mind at all. 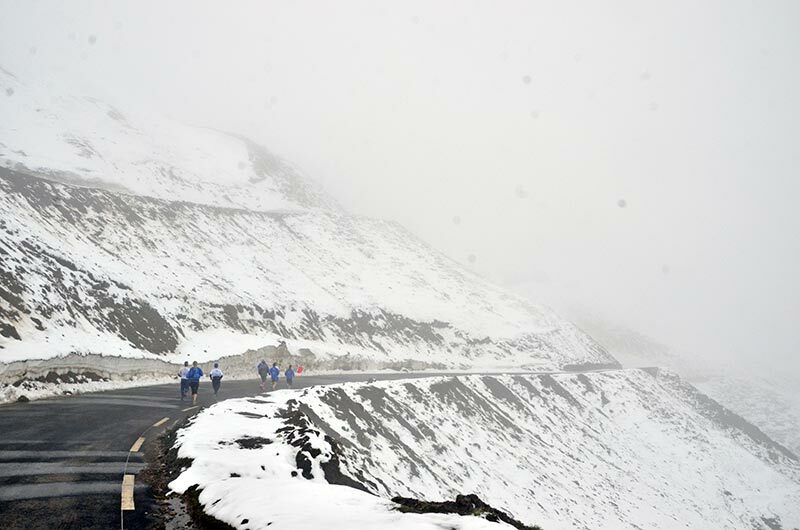 The beauty of climbing the Col du Tourmalet on that particular day was enough. In the end I climbed (19km) from Luz St Sauvent to the top in 1.02.30. An average speed of 18km/h (12 mph). Without sweaty thermal tops and spare 1 litre of water, I might be able to creep under an hour – it does entice you back to have another go. After the ascent – I descended 20km down the other side. 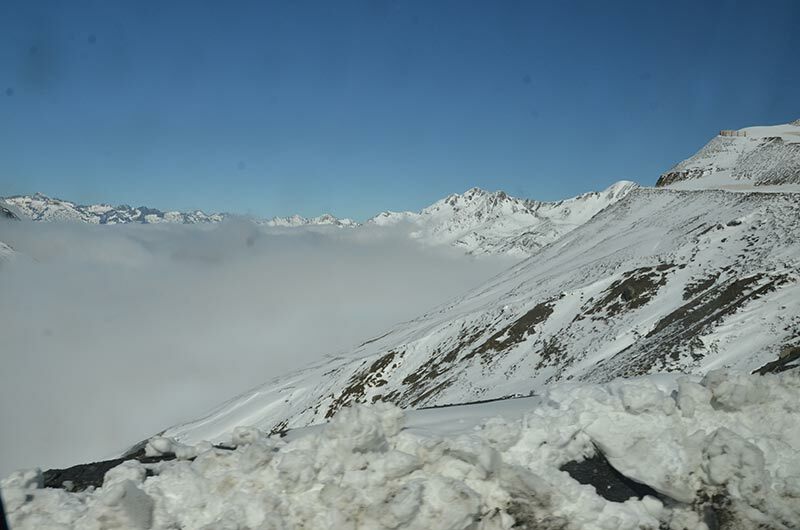 The other side is not as attractive – there is a sprawling ski station, which doesn’t sit too well in the Pyrenean landscape. In England – you enjoy all of the very brief descents, but I’ve never descended something like that 20km – I wondered if it was ever going to end. It’s actually really hard work on the shoulders – braking and holding on. Still it was fun in it’s own way. At the bottom of the descent I did a u-turn and went back up the Easterly approach. I think this side is raced more often. The first kms are quite gentle (5-6%). 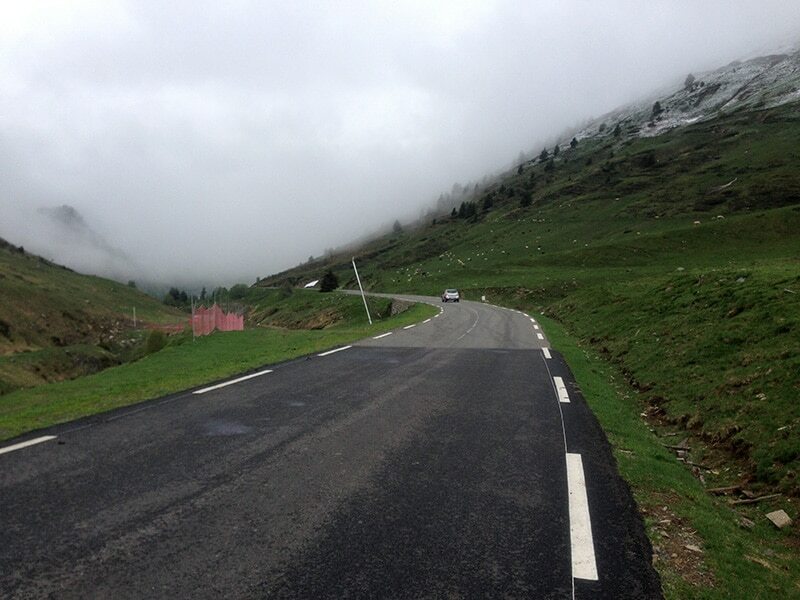 But, then the last 12km are remorseless – that very challenging Pyrenean gradient of 8-10%. One thing they have done is put km signs on the road- telling you how far to go, and the average gradient of the next km. What this made me realise is how much of a difference there is between riding an average gradient of 6.5% and a gradient of 8 or 9%. It may sound counter-intuitive, but in the Pyranees, you can see a 6% gradient and think – a good opportunity for recovery! It is one thing to ride a mountain pass when you’re fresh. 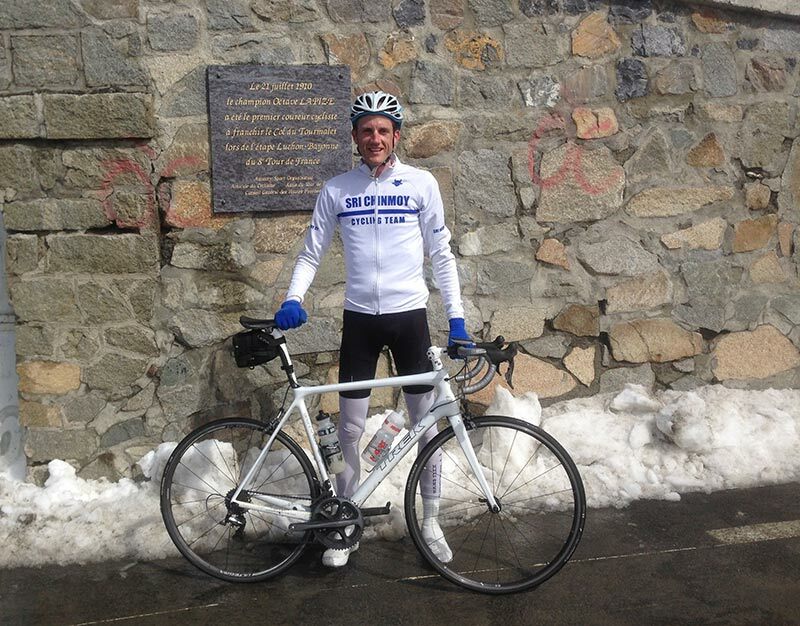 It’s another thing to ride the Col du Tourmalet after 50 miles and 2,000m of climbing already. This second climb was a completely different kettle of fish. There was no sense of trying to ‘race’ the climb – it’s more survival mode. What rhythm and cadence can I maintain? In England I’m often left thinking – I wish this hill was longer and steeper. 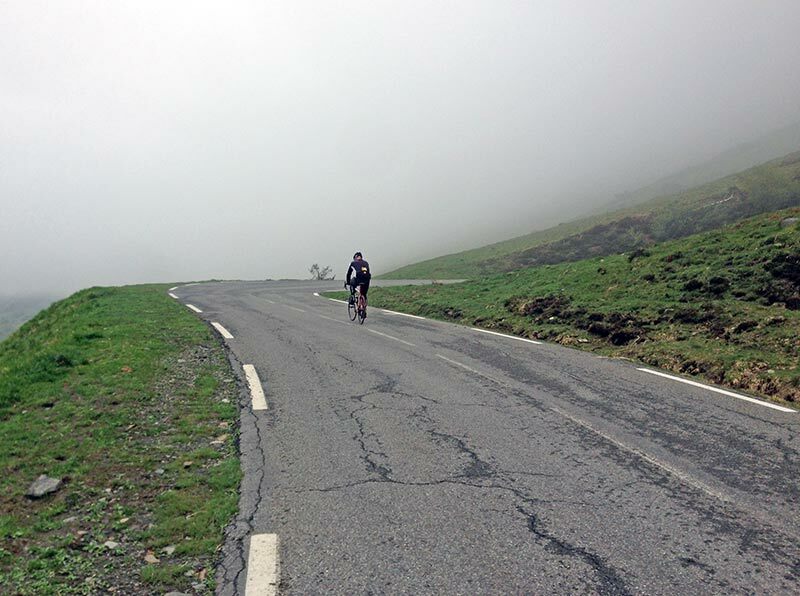 In the Pyrenees – you never think this! I was really counting down the km markers – with an increasing exasperation that they seemed slower to appear. 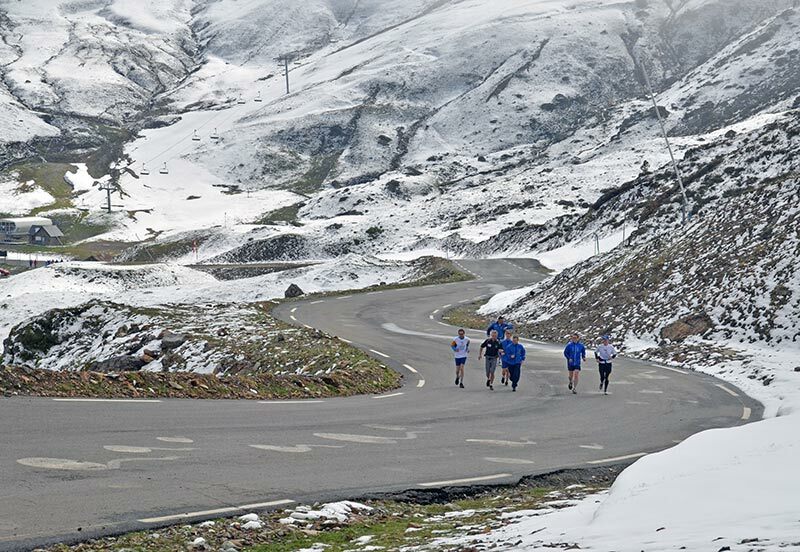 The last 7 km from the ski station is a real toil as you grind away. On the way up from the West, I was imagining what it might be like to ride in the front of the peleton. On the way from the East I was empathising with the ‘auto bus’ – those riders just concerned with making the time limit. I did the 17.5 km climb in 1.06. An average speed of 9.8mph (16.7 km/h)- still quite respectable for the climb. Near the top, I saw the weather station which offers another 200m and another challenging climb. It seemed a shame to go all the way to the Pyrenees and not do this last little bit. But, I was really exhausted, and a bit dehydrated. Fortunately, I met a group of riders from Surrey who had two support vans (that’s the way to do the Pyranees), I asked for a bit of water and got some energy powder too. I was very grateful. 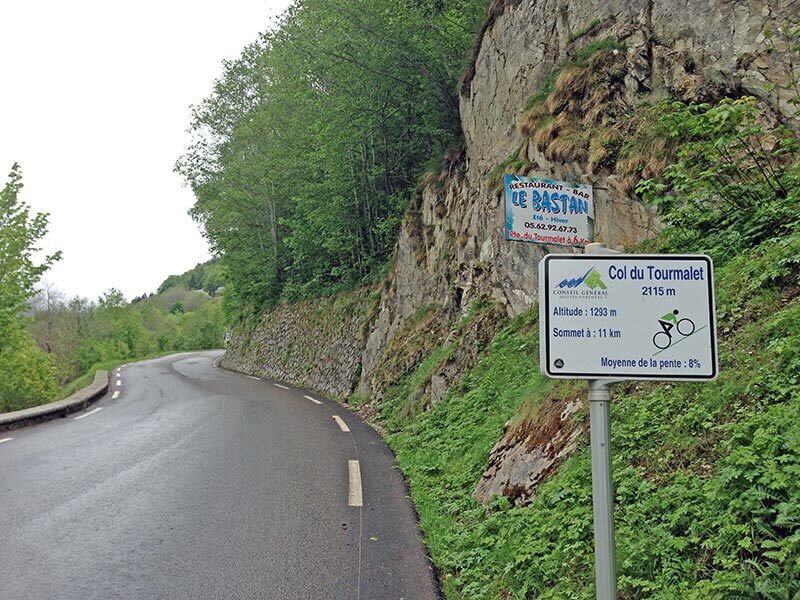 After descending the Tourmalet, I still had to go back to Garvanie. I didn’t think of it as a climb. But, actually it goes up 700m to a height of 1,388m at an average of 4%. This is still more climbing than highest climb in England. The total ride was 82 miles and 3,700m of climbing. The only thing I would do different is not wear so many warm clothes. 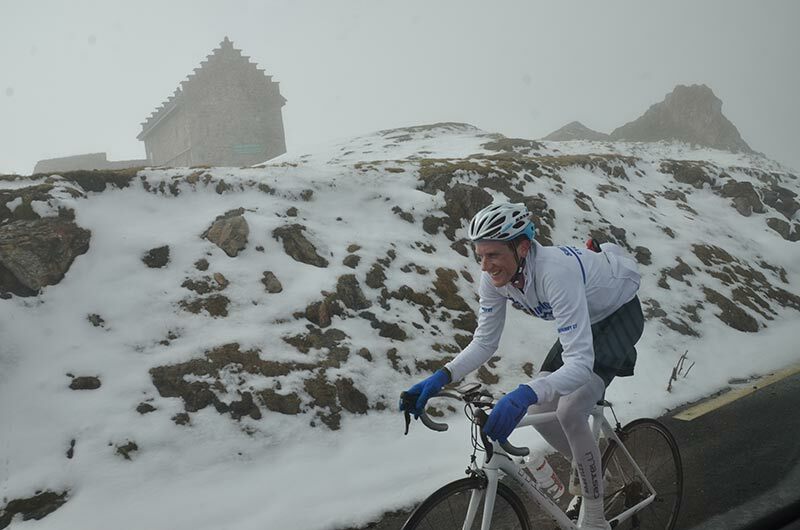 I still got cold on the descent, because I had accumulated so much sweat on the ascent, I don’t think I was any warmer. The main thing is to put on a jacket on the way down – the wind chill factor is amazing. The sun is very strong in this part of the world. I bought some emergency factor 50 after the descent. So that was the Col du Tourmalet. Three times in two days and a real desire to go back and do it again! 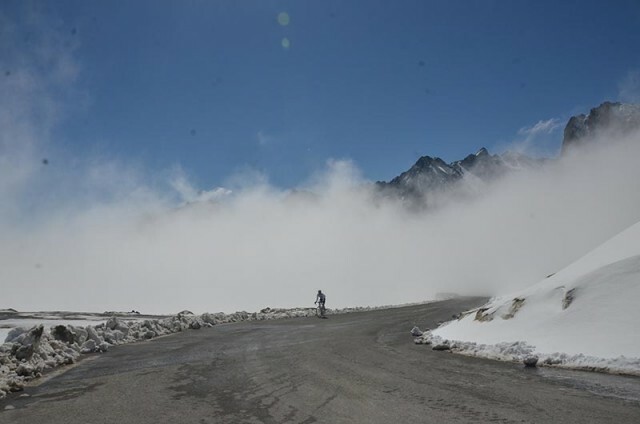 I don’t really believe in selfies, but you can make an exception for the top of the Tourmalet. The unending climb. Mountain climbing. A sign at the top. 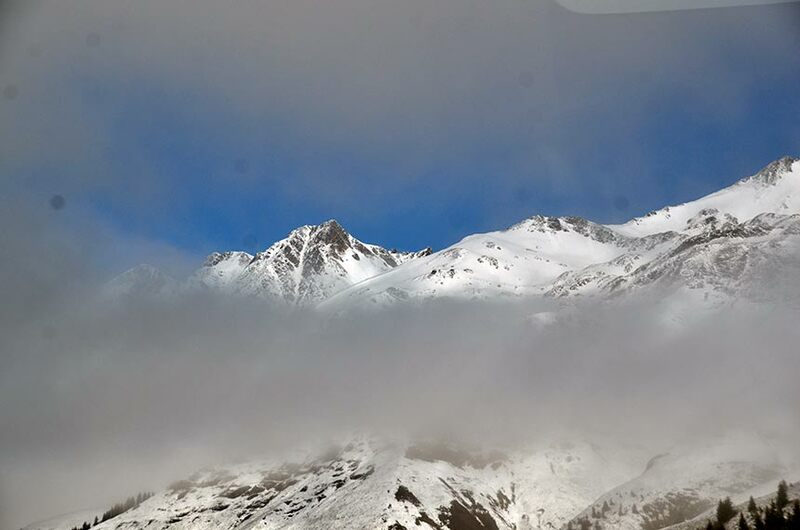 The Tourmalet – above the clouds. That’s a mountain. Amazing weather. All changes in five minutes. 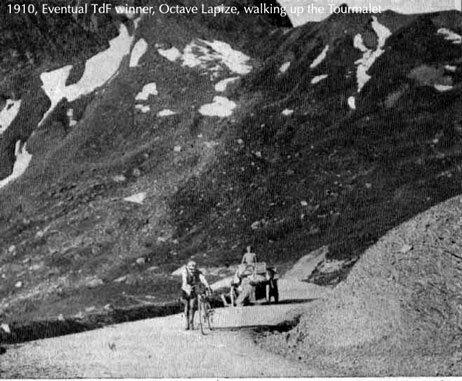 Lower slopes of the Tourmalet. Beautiful meadows. Very enjoyable account of your rides Tejvan. 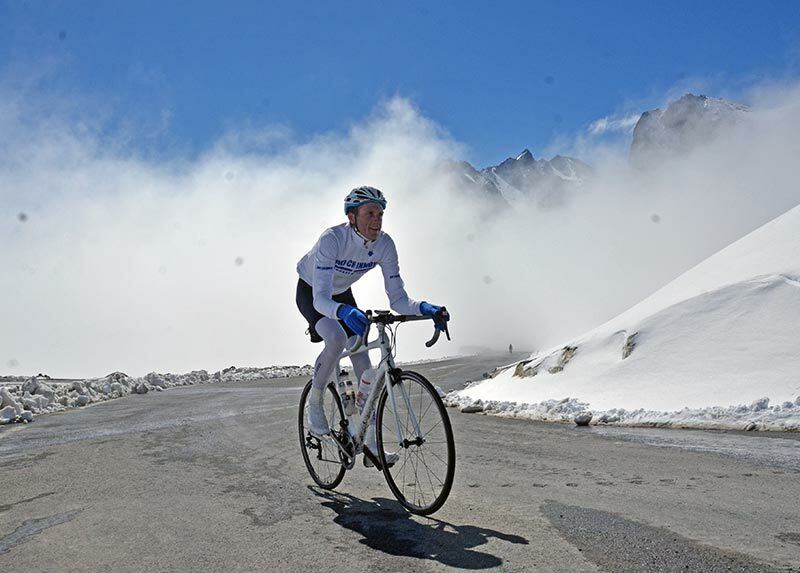 Love the picture of you riding with clouds and peaks behind, cycling uphill indeed. i love your blog. keep climbing..
Great post and especially the images. Glad you made it to the big climbs you’ve so often mentioned here. Getting the right layers seems half the battle. Oh and the climbing too! 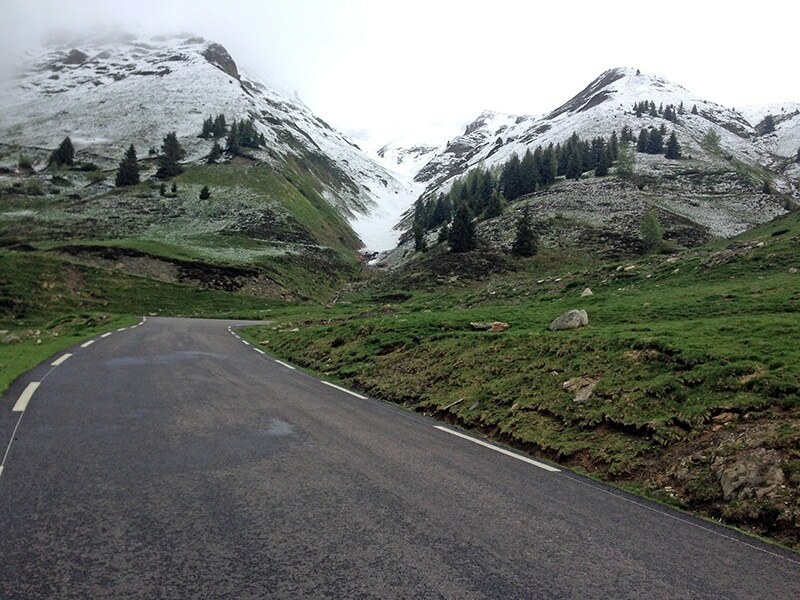 Like you Tejvan, “I’ve been wanting to ride Alpine style climbs for years”. It’s daft that I’ve been cycling for so long but I’ve never ridden the Alps or the Pyrenees – in the summer I always seem to be racing, or preparing for the next race 🙁 Maybe 2016 for me! Great photos, and the Luz Ardiden blog is great too, thanks for sharing.